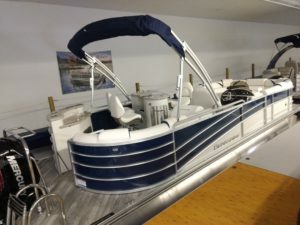 This is a 2018 Berkshire, 25′ Berkshire Tri-Toon with Mercury 200HP Verado Four Stroke Motor. This Trip-toon has White/Navy Blue exterior. This boat features a Bar and 4 Bar Chairs, Sink. Upgrades include Teak Vinyl Floor, In-Floor Storage and JL Audio and Sub Woofers!